I’m in Fogville. Every morning it is dark, every night it is dark, every afternoon, well you know the rest. 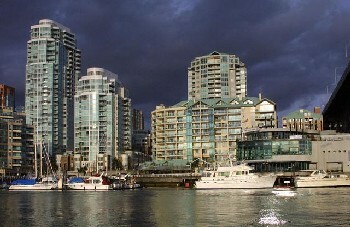 I am in Vancouver BC and it has been foggy and cold each day so far, oh and its rained for a change too. So, I’ve not been uploading images this week. I’m on a dial-up too and I’m not able to really upload much of anything. I tried to take another picture from my hotel window again. If you would like a big grey image I would upload it, but however it is not much fun. I found a new chicken wing sauce that is my new favorite. Honey Garlic! I had dinner at a restaurant called Montana’s last night and had chicken wings that were fried in cornmeal then coated with Honey Garlic sauce. They were awesome! Hopefully the sun will come out so I can get pictures like the one above (Taken from Weather.com). Previous PostWhere is Drew?Next PostBoston Pizza?